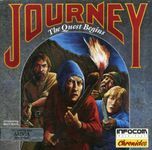 Journey: The Quest Begins is an interactive fiction computer game, designed by Marc Blank and David Longosy, and released by Infocom in 1989. Like the majority of Infocom's works, it was released simultaneously for several popular computer platforms of the time, such as the Commodore 64, Apple II, and PC. Journey is unusual among Infocom games in that it could be played entirely via mouse or joystick with no typing required. It was also the thirty-fifth and last game released by Infocom before parent company Activision closed the Cambridge office, effectively reducing Infocom to a "label" to be applied to later games. The game package acknowledges the strong influence of Tolkien on the plot of Journey. A land reminiscent of Middle-earth has been ravaged by a mysterious, evil power. Crops, water, and the inhabitants themselves suffer from unexplainable illnesses and blights. A group of villagers ventured forth to seek the help of the reclusive wizard Astrix, but they have not been heard from in months. It is feared that few will survive the additional hardships of the coming winter, and so a second group is being dispatched. The four chosen are Bergon (a young carpenter), Praxix (a wizard), Esher (a healer), and Tag (a merchant). They leave their village behind to cross unknown lands with two goals: to discover the fate of the earlier party, and to plead Astrix for assistance. The player's character is a peasant who tells the members of the party commands (a la Suspended).